In the not-too-distant past, not enough attention was paid to the slab. The foundation hole was dug and leveled, and then four to six inches of concrete we poured into the forms. Some builders still take a similar approach to the slab (especially what is under it). But concrete slabs aren’t like carpet. Once the concrete is poured, there’s no easy way to take corrective action. If structural supports, steel reinforcing, vapor barriers, and thermal breaks aren’t installed correctly underneath the concrete, then you are stuck with it. It’s tempting sometimes to take a casual approach to anything that will be hidden and, sadly, some builders do just that. I continue to see local contractors pour slabs with no slab-edge or underslab protection. While this may save the builder several thousand dollars on the cost of building a home, it will always come back to bite its owners to the tune of multiple thousands of dollars over the years with heat loss, air and moisture infiltration, mold, and just downright discomfort in a cold new home that ought to be warm. Appraisers can’t see what isn’t under a slab, so they often appraise these kinds of homes as if they will perform like homes that are built correctly. 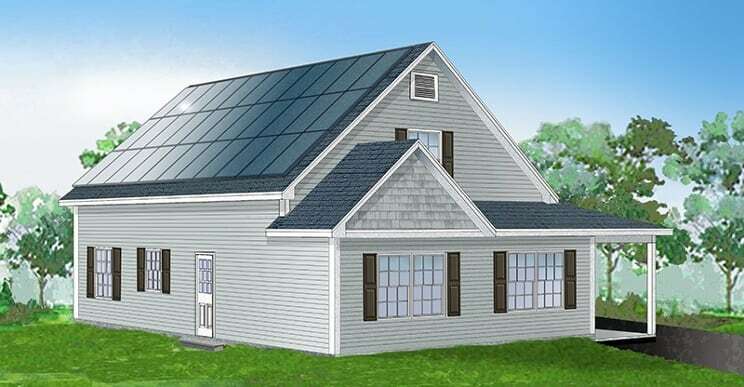 Last week’s blog described the typical High Performing (HP) slab we use in our affordable Zero Energy Homes. This week and next, we’ll dissect it. 2 ½” Polyiso Slab Edge Protection – This type of Styrofoam has the highest R-value per inch. Code requires an R-15 edge but we don’t want to use anything that’s too thick because we want to provide as much bearing as we can for the wall to sit on while hiding the insulation underneath it. 3 ¾” EPS (Extruded Polystyrene) is installed underneath the bulk of the slab, except where there might be a structural need to support something above it, like a bearing wall or a post. The Polystyrene that we use is called “Envirosheet” and performs with a resistance of R-15. This meets code. 4” SilveRboard is installed anywhere there is a need to support loads above it. SilveRboard has sufficient compressive strength to support basically any load-bearing walls or support columns. 2” Styrofoam is used vertically on the inside of the foundation wall. This provides a good thermal break between the outside temperatures and inside. However, you will note that this insulation is not required to produce an R-15 protection. 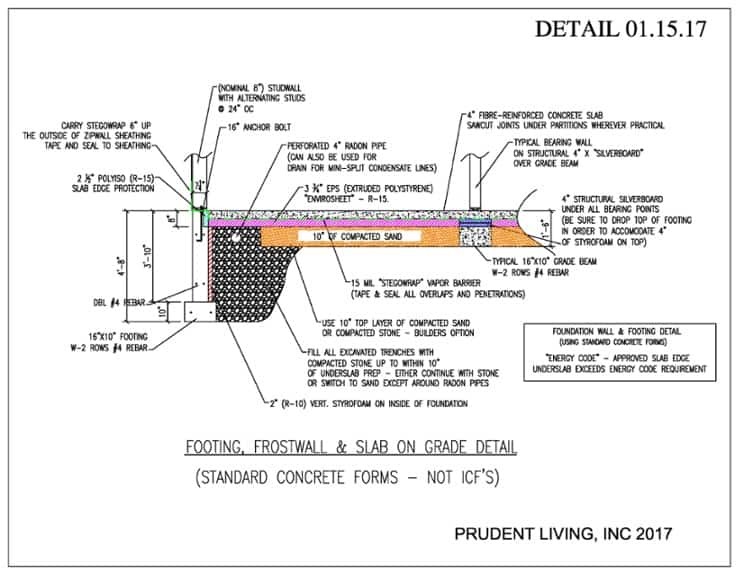 At Prudent Living, we install this “because we can.” There’s no better time to do it than before the foundation is in-filled with stone and it’s just our “baker’s dozen” way to prevent as much cold from getting underneath the slab as we can. You may ask, “Can I add more than 4” of insulation under a slab, and is it worth it?” The first answer to that question is that “You can add as much insulation as you want.” The second answer, however, is a little more difficult as budgets and diminishing returns come into play. It’s important to weigh all the advantages and disadvantages when deciding just how much money to invest in underslab insulation. We have determined that the approach described above is the most cost-effective way to build a house on a slab. Of course, if you have plenty of money to spend, then I’d love to see 6” or even 8” of foam installed underneath a slab. I’d also recommend using ICFs instead of using our poured wall method, but while all these things may provide the ultimate in preventing heat transfer (heat always moves toward cold), they also can wipe out a budget and prolong payback out to 30-40 years. We know that we can achieve a HERS rating of zero or even lower with the foundation that has been described. Not only that, it comes with a payback of less than 10 years. For most of our clients, this is all they want. Vapor Barrier: If you look closely you can see a notation that points to a dotted line between the 4” concrete slab and the insulation beneath it. This is a very important product called a Vapor Barrier which, when installed correctly, prevents vapors from migrating up through the concrete and permeating the house. There’s a rule in construction science that says when vapors move, moisture moves with it. So, if you want to keep moisture from migrating, you must keep vapors from moving. Vapor barriers prevent long-lasting issues inside the house. We prefer to use a vapor prevention product called “Stegowrap.” It comes in various thicknesses. Our favorite is 15 mil, which is very thick, heavy, and strong. Years ago, the standard vapor barrier was a 6 mil polyethylene, but we discovered after taking up portions of slabs that we had poured decades earlier, that the polyethylene had decomposed and was no longer functioning as a vapor barrier. When we install Stegowrap, we unroll it across the insulation in overlapping rows. After that, we take Stegowrap Tape and seal all the overlaps and plumbing/conduit penetrations so that no air can find its way up through holes in the barrier. We also drape the Stegowrap over the sides of the foundation so that after the slab is poured, we can wrap the barrier up the outside of the house and seal it to the exterior sheathing, which is also an air barrier. This method completely seals the air and moisture vapors in the ground and prevents them from getting into the house. Compacted Stone: In the old days, we used gravel and sand to infill our foundations. We had to compact it over and over and over, using water and compactors to pound the soil into a maximum density rating that would pass a compaction test. Even then, we worried that the sand and gravel would settle within a couple years, causing a slab to crack and move. And despite all that worrying, it did anyway. What a mess to try and fix! Now I prefer to use stone instead of gravel/sand. There are several reasons. The first reason is that stone only requires one or two passes to fully compact and then it’s as hard as stone can be. The second reason is that trucking costs more than the materials. So, if the trucking costs are the same whether I use stone or sand underneath my slabs, then why not buy stone instead? Third, it’s a labor saver and fourth, it gives me peace of mind. There’s no better structural weight transfer than concrete to stone to virgin soil. There are other significant advantages as well. Stone also serves as a breathable bed for Radon to migrate to Radon ventilation pipes. While it may not sound like much, you’d be surprised. Radon: In any situation where Radon has been identified, you should rely on a mechanical system to remove it or prevent it. This is cheap insurance. It should also be stated that no matter how airtight we build a home, it will never be 100 percent airtight and if there is radon present it will find a way to get in. Even vapor barriers have a permeability rating. This is a little bit like insulation R-values. If something has permeability rating, all it means is that one product is compared to a standardized test as to how long it takes a vapor to get through. So, we don’t really know how or where Radon gets into a house. All we know is that it does. It could come through footings and concrete or sideways through the foundation walls. Who knows? Therefore, it is prudent to plan for it under our slabs even in new houses where underslab radon protection may not be required.